In my quest for new smoothies this year, I came across a book with the rather intimidating title: The Women's Health Big Book of Smoothies & Soups: More than 100 Blended Recipes for Boosted Energy, Brighter Skin & Better Health. Although I liked some of the smoothie ideas, I looked askance at the blender soups, particularly those made with all raw ingredients that could be served hot or cold. Yet, Radiant Red Pepper Soup was compelling—especially with 5 red bells in the fridge due to a hot, long pepper season this year. 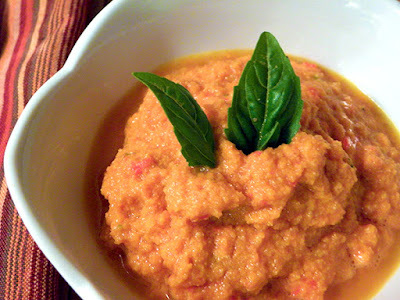 I whipped up this soup as an appetizer, thinking that the flavor would be more healthful than delicious. Sometimes I love it when I’m wrong! 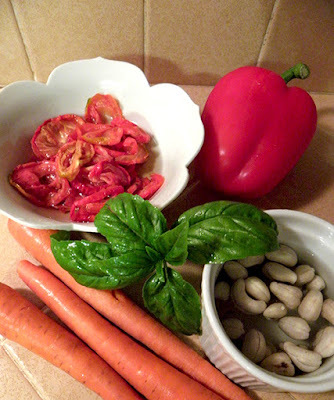 According to WebMD and the most recent Prevention magazine, this soup is healthful in several ways. Red bell peppers are loaded with Vitamin C, and cashews with zinc. Both enhance healing of wounds, and are reputed to reduce the effects of cold viruses. Tomatoes are full of lycopene, an antioxidant that protects the body from free radicals that contribute to, among other diseases, atherosclerosis and cancer. The Vitamin A in carrots supports vision, skin, and the immune and reproductive systems. Interestingly enough, the flavor of this soup changes quite a bit when it’s heated. 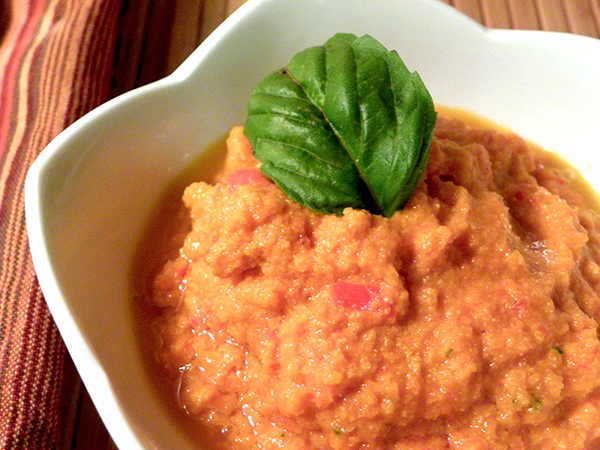 Serve chilled or at room temperature, the carrot and tomato flavors dominate. When it’s heated, the red bell pepper becomes more dominant. The cashews add a mellow sweet flavor; be sure to allow 6 hours to soak them before blending so that their texture will compliment the veggies. Enjoy the last of 2017's extended red pepper season as we approach mid-autumn. Soak the cashews in about ½ cup of water for 6 hours. After soaking, rinse and drain. 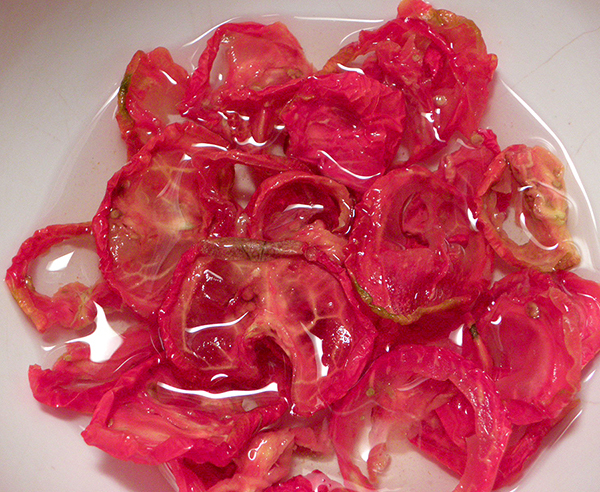 Soak the dried tomatoes in ½ cup of water for 1 hour or more. Do not drain! 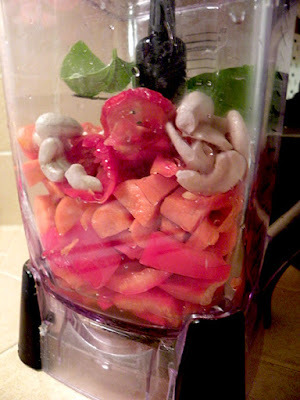 Put all ingredients in blender: chopped red bell pepper, chopped carrots, dried tomatoes and their soaking water, drained and rinsed cashews, ¾ cup water, and basil leaves. Blend until desired consistency is reached. 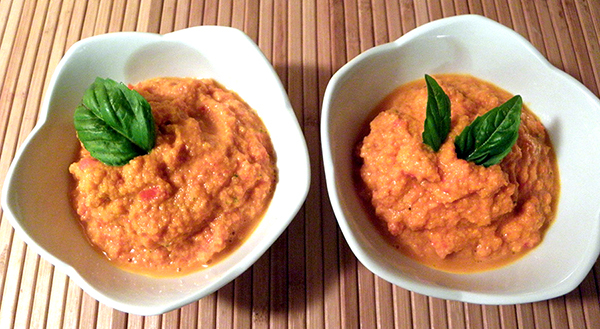 Serve warm or chilled, or at room temperature. Garnish with a small basil leaf or two.